Glad you had a great time! Great purchases as well. Haven't seen Superman Returns, and probably won't until it comes out on DVD, but I've heard that some aspects of the plot leave a lot to be desired. Those mittens are tremendous!! 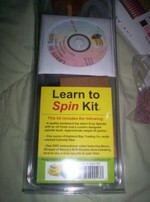 Patrick got one of those spinning kits too. You made me giggle over the militant black woman or cancer survivor remark... lol! Has your mom seen it yet? You really got your knitting mojo back. I need to go on a quiet retreat (or maybe a multi-state yarn shop tour). love your hair! how is your Diva coming along? I noticed on the KAL list you are working on one too! Watch out for the militant knitter ya'll!! Whoooweeee you have gone to town on your knitting. Can you please rub some of that mojo off on me! !